Learn how to set up your Mail Basic email account on your iPhone or iPad. For Mail Business email accounts, please reference Add a Mail Business Email Account to Your iPhone/iPad. Enter your account details and tap Next. Name The name others will see when receiving your mail. Email The complete email address of your 1&1 IONOS email account. Password The password you entered when setting up the 1&1 IONOS email address. Description Enter a description for your account here. This information is only used to better differentiate your account from one another. 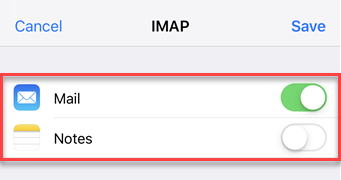 Receive your mail using the IMAP (recommended) or POP protocol by entering the respective host name for Incoming Mail Server. Enter the remaining data and tap Next. The email account is automatically set up with SSL encryption. The device performs the correct configuration in the background. You no longer have to set anything manually. The SSL settings can also be checked later. For more information, see Enabling SSL encryption on your iPhone/iPod/iPad. Select which data (mail, notes) you want to synchronize and confirm with Save. Your email account is now set up. You can now check your mailbox and send emails on your iPhone.